Apple has quietly discontinued the 40GB Apple TV overnight and reduced the price of the 160GB model down to $229. Previously, the 40GB and 160GB models were priced at $229 and $329, respectively. 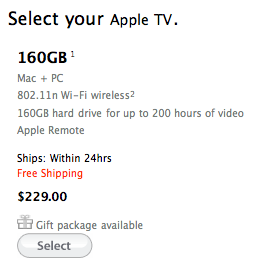 Now Apple is offering only a single 160GB model at $229. The changes fulfill an analyst prediction based on slipping ship dates for the 40GB model. The Apple TV hardware has remained essentially unchanged since its introduction with the exception of hard drive size. Apple has always referred to the AppleTV as a "hobby" project and is still exploring ways to expand the market. Meanwhile, a new report claims to have found evidence that Apple's new iTunes LP bundles were likely formatted specifically for the Apple TV. This would suggest we should see a major Apple TV software update in the near future.